Khorasan means the land of sunrise. The older Persian province of Khorasan included parts which are today in Iran, Afghanistan, Tajikistan, Turkmenistan and Uzbekistan. Some of the main historical cities of Persia are located in the older Khorasan: Nishapur and Tus (now in Iran), Merv and Sanjan (now in Turkmenistan), Samarkand and Bukhara (both now in Uzbekistan), Herat and Balkh (now in Afghanistan), Khujand and Panjakent (now in Tajikistan). In its long history, Khorasan knew many conquerors and empires: Greeks, Mauryans, Arabs, Seljuk Turks, Safavids, Baloch, Pashtuns and others. Khorasani people are Persians, linguistically, culturally and ethnically (although throughout history other ethnic group such as Pashtun, Hazara and other Turkic people inhabited parts of Khorasan). 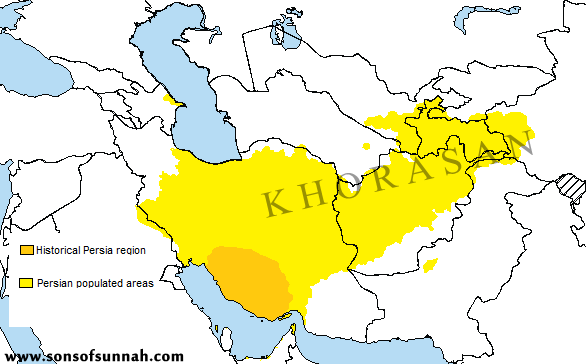 All Khorasanis in all parts of greater Khorasan all the Persian language (in different dialects, just like Arabs have different dialects). It’s just like an Qahtani Arab and an Adnani Arab, or an Arab from the Bani Tamim tribe or an Arab from the Bani Marzuq tribe, they are both Arab although they might have different dialects and accents and also differ (often heavily) in many cultural aspects (although unite in some basic aspects that are shared by all traditional Arab tribes), some even differ ethnically, like Nubian Arabs of Sudan who are obviously mixed with native Nubians, or Arabs of the Maghrib, many of them either of Berber origin or heavily mixed with Berbers, nonetheless, they are today all considered as Arabs since they share one language and one culture (even if accents and cultural aspects may differ in some aspects). Herat for example which is located in modern day Afghanistan (Afghanistan is originally the land of the Pashtuns i.e. Afghans. Herat and large part of Afghanistan are not Pashtun/Afghan land but Khorasani land where Persian speakers make up the majority up to this very day) is a historical Sunni Khorasani city (many scholars of the Salaf emerged from there). Herati people are hence Khorasanis who speak Persian (Dari dialect), they share the same culture, tradition and even dialect and accent (to a certain extent) with the Persian Khorasani people of Iran (most Persian Khorasanis are Shias, yet even Mashad as an Iranian Persian Khorasani minority, and there are some Persian Sunni majority cities in Iran, like Birjand etc. ), after all they are neighbour and have naturally more in common then let’s say with a southern Iranian from Bandar Abbas who has more in common with Gulf Arabs than with Khorasanis. This is why a Tajik (what many Persian Sunnis in Afghanistan are called) have much more in common with an Iranian Persian Khorasani then let’s say with a Pashtun. The fake politcal borders though will of course seperate a people (just like the fake borders of Pakistan and Afghanistan have separated the proud Pashtun people from each other) and suggest otherwise. Today some Afghans may refuse to call themselves Persian or even Khorasani, however this doesn’t change the fact that the Tajiks of Afghanistan and the Heratis etc. are all Persian speakers and Khorasanis. Modern day politcal borders don’t define us, what defines us is our history and historically Herta for instance was even part of modern day Iran not too long ago (lost to Britains by the Treaty of Paris, 1857) and Merv (located in modern day Turkmenistan many great Sunni scholars emerged from this Khorasani city) by the Russians in 1893.
hence it doesn’t matter if Imam Bukhari was born in a place which is today called “Uzbekistan” and is mainly inhabited by a Turkic people. What is important is that parts of Uzbekistan (Samarqand and BUKHARA) where always Persian land, to this the people of Bukhara and Samarqand (Tajik Persians, a minority in Uzbekistan. Many heavily mixed with Turkic-mongolid people) speak Persian (Dari form), and this part of the world was always part of greater Khorasan, hence Imam Abū ‘Abd Allāh Muḥammad ibn Ismā‘īl ibn Ibrāhīm ibn al-Mughīrah ibn BARDIZBAH was never called an “Uzbek” , rather Imam Ibn Hajar (in his Muqaddimah of “Fath al-Bari”) called him a Persian. Same goes for the Persian (or Tajik, or Khorasani, all words refering to a people who share one language to say the least) people of Khorasan in Afghanistan (and Tajikistan which is over 95% Persian-Tajik and Sunni). This entry was posted in Persian Sunni Poets, The People of the Sunnah in Iran. Bookmark the permalink.